Adalyn is growing so fast and will very soon need to switch from an infant car seat to a convertible car seat. Safety is very important with a baby, especially in tough driving conditions such as snow and ice. I did some research on the best car seats and something that kept coming up as a highly rated brand was Diono. We were sent the Diono Rainier convertible car seat and booster to review. The rainier model of car seat is new from Diono. It has extra deep side walls for additional side impact protection. Something else important to me is being able to rear-face past the time that Adalyn would be in an infact seat. This car seat is rear facing from 5-50 lbs and forward facing from 20-90 lbs. For kids 50-120 lbs, it can convert to a booster seat up for up to 57 inches tall. It has adjustable head support and EPS foam that surrounds the childs head and body. The Diono Rainier is available in different colors including white houndstooth, purple, blue, grey and more. Looking back, I would consider buying this car seat and not an infant seat seeing as it can fit all different sizes. Since you can use it for so long, it makes the price a lot more worth it. This car seat retails for $287.99 but can be found on Amazon for $269.99. 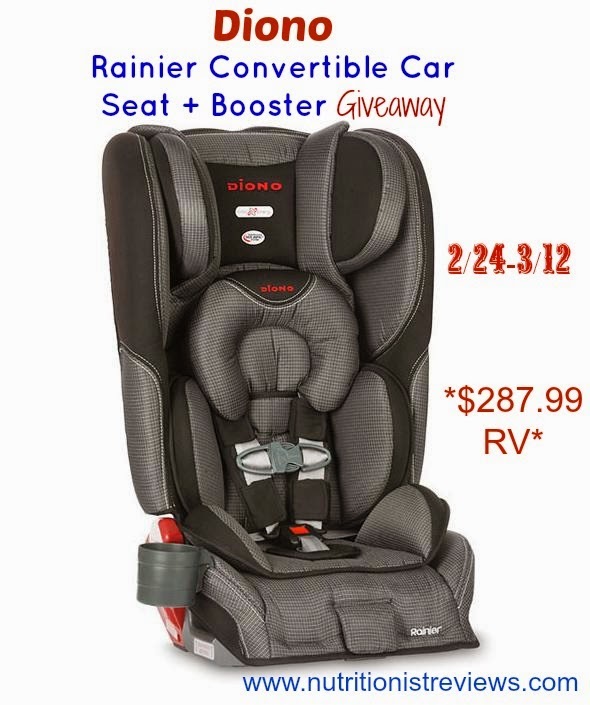 The giveaway will be for a Diono Rainier Car Seat to one lucky winner (RV $287.99). I love the Rainier. It would be great to have in the Shadow color. I like the sola a backless booster seat! I like the Rainier White Houndstooth. I love the Rainier Car Seat in blue! I love the awesome features of it! We've never owned a Diono, I always hear amazing things about them. I love thier extended rear facing capability!!! The Houndstooth Rainer is beautiful...so is Orchid. I like the Solana booster seat, it fits children 40 lb to 120 lb. The Pacifica Convertible+Booster Car Seat interests me. cheap oakley sunglasses uk I can help oakley sunglasses sale uk them cheat, turning a blind eye as long as the time you are old. Of cheap oakley sunglasses uk course you need to do is to signal shielding cheap oakley sunglasses uk device off. You use a small radio cheap oakley sunglasses uk propagation answer. http://www.witchita.co.uk This is cheating, if something goes wrong we will steal sheep. I LOVE Diono. They're especially great for their extended rear facing capabilities. My son is extremely tall and it is difficult to find a seat that would allow him to RF for as long as possible. One of the many reasons I love them :). I like the Shadow color option for the Rainier... I see that they also do strollers, and the sun/insect net is such a great idea! Im not sure if I can really carry it like a backpack for very long. I will just carry my infant and strap this sucker to the stroller when traveling through the airport.